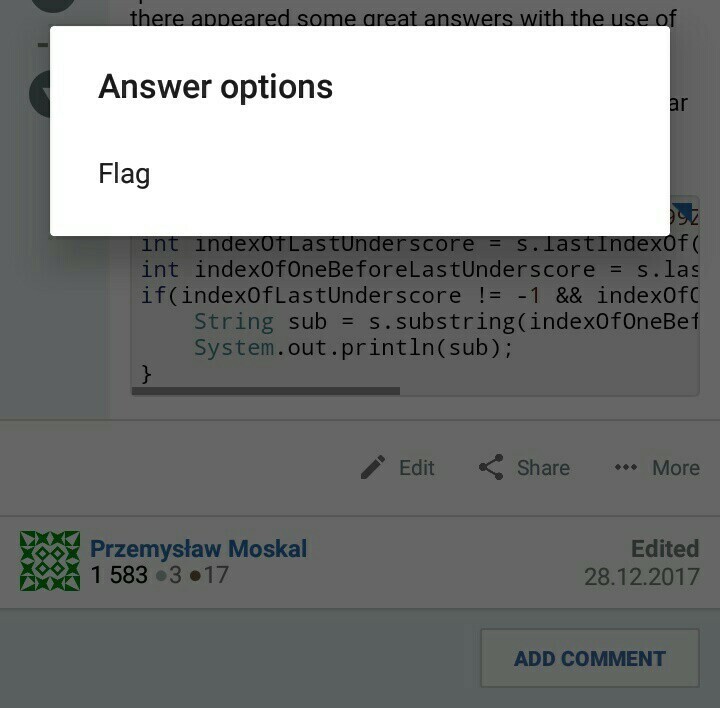 When searched for the way to delete my answers, many topics say about "Delete" button that appears under my answers, but I don't see such a button (no matter if using the app or a browser on my mobile phone, I see "Edit", "Share" or "Flag" there). Are the answers about "Delete" button out of date due to change of rules of deletion of answers here or am I just missing something? Is the proper amount of reputation points needed to see such a button (when asking this question I have about 1600 points)? The answers I want to delete are not marked as accepted. 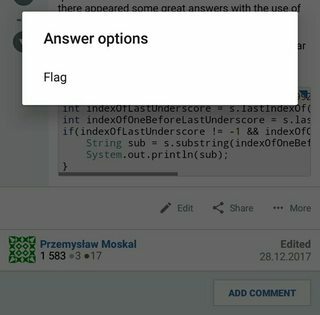 I know that I can flag my answer to get moderator's intervention and describe that I wanted to delete my own answer, but I'm not sure if it is the only/proper way to delete my answer and to wait then until it is reviewed by others. I tried to use these 3 dots many times before and in my mobile browser, tried to change to Desktop view. This keeps redirecting me back to the Stack Exchange app. You can't delete posts from the android app, unfortunately. You need to be on the full site to do stuff like that. Press "... More", then "Open in browser". There you will find the Delete link. If in the browser you are redirected back to the Stack Exchange app, go into the Application Settings, find the app, and remove its default Supported URLs to prevent this. Not the answer you're looking for? Browse other questions tagged support android-app mobile-web vote-to-delete . Why do I have 12K rep increase on my profile in Meta?